This is our company's logo marble. 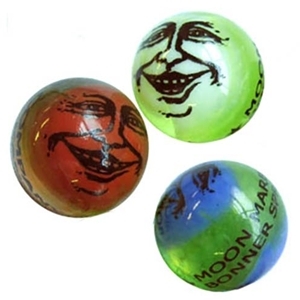 The "Moon" face is printed on a 1" diameter older style vaseline marble. Vaseline glass contains uranium oxide which causes the glass to flouresce under a black light (shown in 2nd photo). Comes in an assortment of uranium oxide marbles with patches of red, blue, or white. The color/style you will recieve will be determined upon availabilty. If you desire a certain color/style, you may request it in the item notes in your shopping cart. We will do our best to give you the color you request. Warning: Choking Hazard. This toy is a marble. Not recommended for children under 3 years.